Recently went into the jungle around Chiang Ma on Flight of the Gibbon, the second time in less than a year I have gone on this awesome zipline experience. I highly recommend it. One of the highlights for me was seeing gibbons swinging from one branch of a tree to another. Their agility was astounding! Here is a video I took of my fortuitous sighting. Also, a video of my fairly timid mother and how she found the experience. It's a great experience for all! Go do it! Bangkok, where businesses don't even bother shuttering the windows it's so safe. Buddhist societies are probably the most trusting in the world. It's exemplified by this local fruit and flower stand which think nothing of leaving their storefront totally unlocked for the entire weekend. And while only homeless people in most countries would steal the bananas, the orchids are in fact rather valuable, and would represent a decent loss to the proprietor were they to find them gone. This is in sharp contrast with Saudi Arabia, a place where, although you could leave your car window open and your wallet on the front seat, and be guaranteed to find it there when you return, the reason for this is quite different: because the penalty for theft is getting your freakin' hands cut off! You stand as a "farang" (foreigner) in Bangkok if you're white. The know with a fair amount of certainty that you have more money than the average Thai person, and the lcoal merchants are always looking to make a few more baht per transaction. 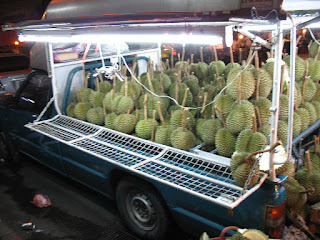 Approaching a durian truck, we inquire about a piece of fruit. The grumpy truck owner offers to sell it to us for 480 baht. As it was an especially large piece of fruit we ask if we can have half the fruit. I don't blame him for saying no. But seeing that we also wanted half the fruit, an Indian man in line ahead of us offers to split it with us, and negotiates with the seller. After hemming and hawing, he finally realized that he wasn't going to wring to separate sales out of this, so he cut it in two for the price previously named to the Indian who had been negotiating before us- 400 baht. Worth it? -- 100% oh my God yes. # recommendation of things to do in all of Thailand, maybe Asia. I cannot recommend this enough. Of all the attractions in Thailand this is #1. The beauty of the jungle is immense and combined with the exhilaration and speed of zip-lining, it makes this a must if you are in this beautiful country! 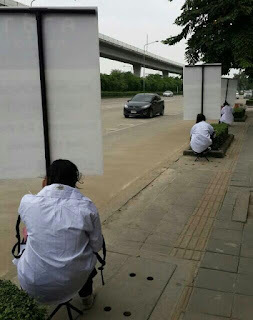 So you're a company in Bangkok and want to advertise to drivers traveling down a road. Sadly, it appears to be cheaper to pay people to kneel for hours holding up the sign, than to get a metal holder to prop up your message. Rule #1- too many people ask the same question about flying here from some distant locale for a week. You'll be suffering from jetlag and regret from the hefty ticket prices you paid for such a such short time. We highly recommend at least two weeks here in Thailand. With that said- here is a link to an itinerary that makes a lot of sense for two week vacationers. Thoughts or comments leave them below.